Orrsome Tassie Trout - Ken & Marea Orr Tasmanian Trout Expeditions. 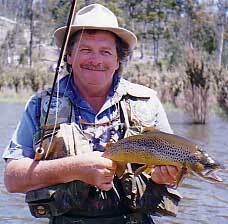 Welcome to Ken Orr's Tasmanian Trout Expeditions, Angler's Retreat and Clearwater Cabins. Perhaps you cannot decide which time of the year to plan a trip. You might be wondering what kinds of activities are available for the non-angler? Can I learn to fly fish or is a fly-fishing lodge stay right for us? What are the benefits of guided fishing versus learning and fishing on your own? These and many other questions are addressed on this web site and we hope they provide valuable angler holiday planning assistance. It is our goal to provide you w ith an experience that assists you in enjoying Tasmania's historical and natural treasures, builds on your skills as fly fishers and meets all of your holiday expectations. We want you to have fun when you come fly fishing with us in Tasmania. We hope that you choose to stay with us at Angler's Retreat and Clearwater Cabins and are anxious to see that your Tasmanian experience matches your dream. Please join our family and become one of our extended angler family members here in Tasmania. So are you ready to go fishing? Come join us!